1984: Ron and Malcolm Binstead develop the first ever keypad, using projected capacitance, for operation through a shop window. The Sensing element consisted of a thin printed circuit board with twelve 1 inch square copper sensing plates. This was patented under patent number GB2161935A. The first versions operated with a BBC computer, but the technology was later adapted to work with PCs. The product was installed in hundreds of Tourist Information shops throughout the UK. 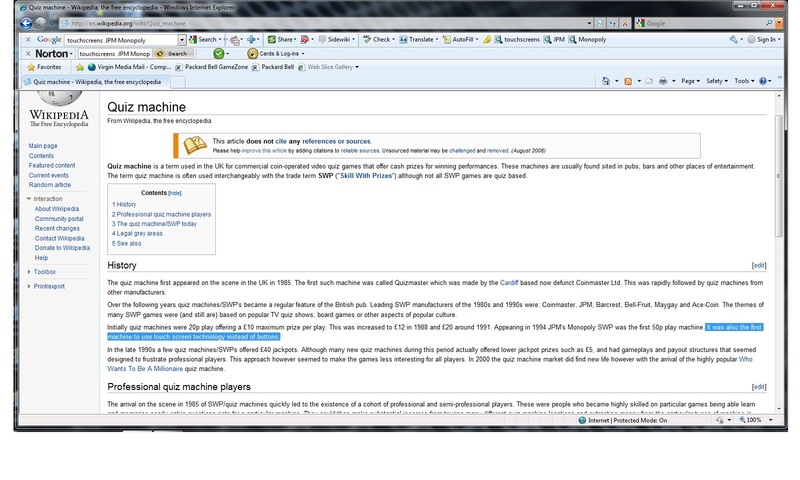 The technology was given the name "Thruglass technology". 95% of the copper in these sensing elements could be etched away, with no deleterious effect. This allowed the development of a translucent, back-illuminated keypad. 1988: Launch of the first "Thruglass" touch screen with 16 sensing areas made of transparent ITO (Indium Tin Oxide). Order received for $0.7million worth of these touch screens, to be installed in a Hotel chain in North America. 1990: Due to the ability to be operated through thick glass, and be unaffected by spilt beer, the keypads were used by MHG (Music Hire Group) in Pub Juke Boxes. 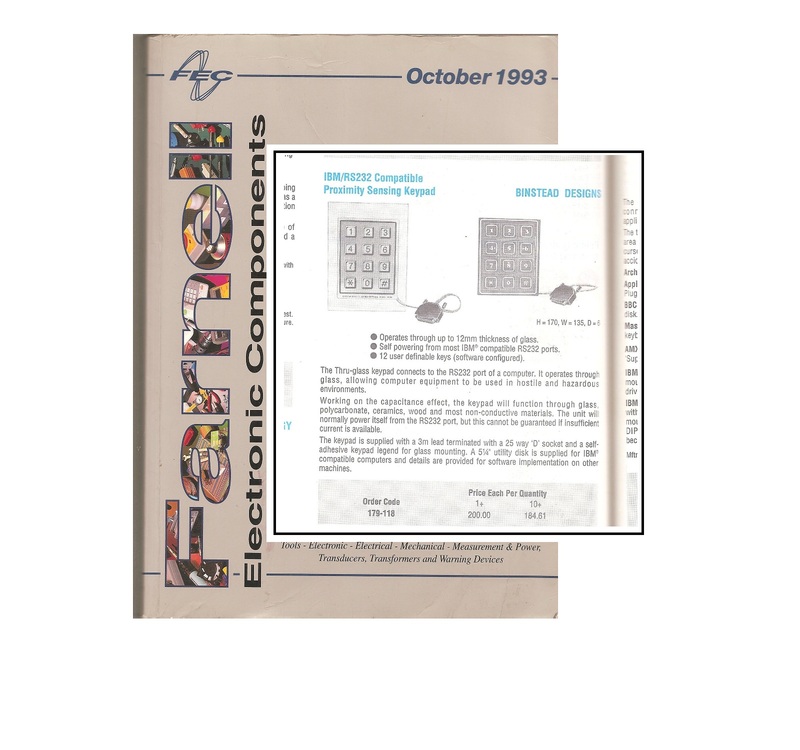 1991: Thruglass keypads listed in the Farnell catalogue. 1994: Development of a transparent, multiplexed "Thruglass" touchscreen, using very fine wire. Sensing elements consisted of 25 micron diameter wire, supported in a thin polyester film. The first 14 inch version had 8 horizontal, and 8 vertical, sensing elements, forming 64 touch sensing areas. Beginning of sales to JPM for their "Monopoly" pub game. This was the first gaming machine to use a touch screen. 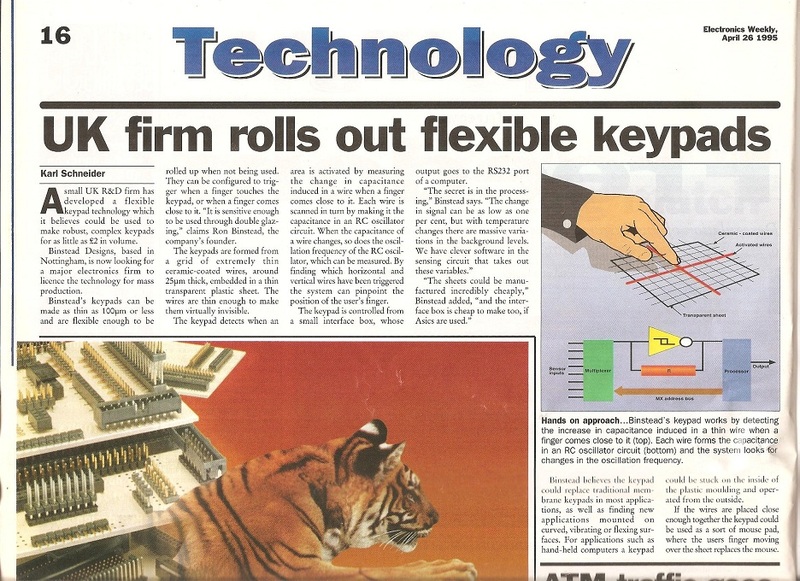 1995: Publicity article appears in Electronics Weekly. 1997: 20 inch touchscreens with 256 sensing areas developed. Interpolation added to increase resolution. 1998: Diameter of wire in screens reduced from 25 microns to 10 microns. Start of licence with Zytronic. Elo-touchsystems coin the term "Projected Capacitive", to describe the technology. 1999: Binstead Designs gains a "Millenium Product Award" for the "Thruglass technology". Touchscreens used in Millenium Dome. Consisted of two 16x16 touch screens side by side on one sheet of glass. 2000: First 40 inch touchscreens with 32x32 (1024) sensing zones. 2002: Initiated negotiations with 3M. 2003: Start of licence with Visual planet. Gradual improvement in speed / size / resolution. 2008: First touch screen larger than 100 inches. Introduction of two-touch Gesturing, and true "two-touch" operation using two independent fingers. 2009: Development of projected capacitance, multiple-touch touchscreen. operable through thin glass, thick glass, or double-glazing, either indoors or outdoors. 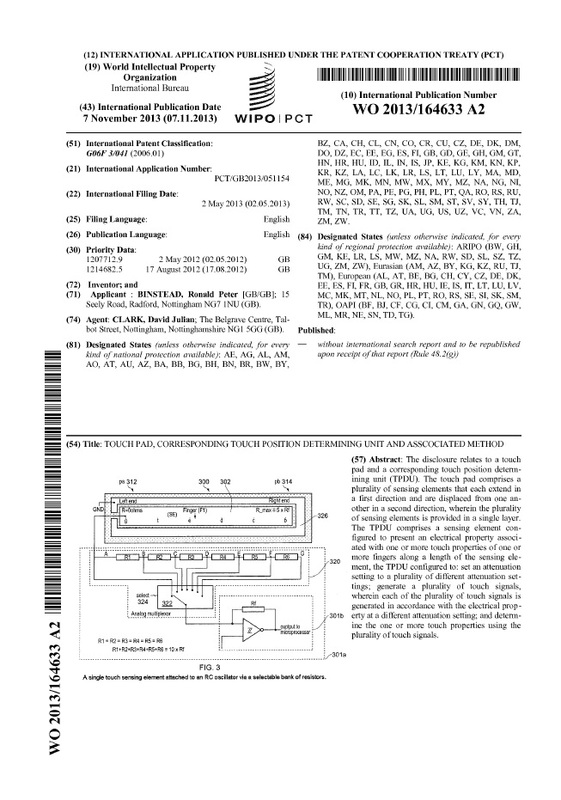 2012: Patent application for projected capacitance, multiple-touch touch-screen with horizontal sensing elements and no vertical elements. 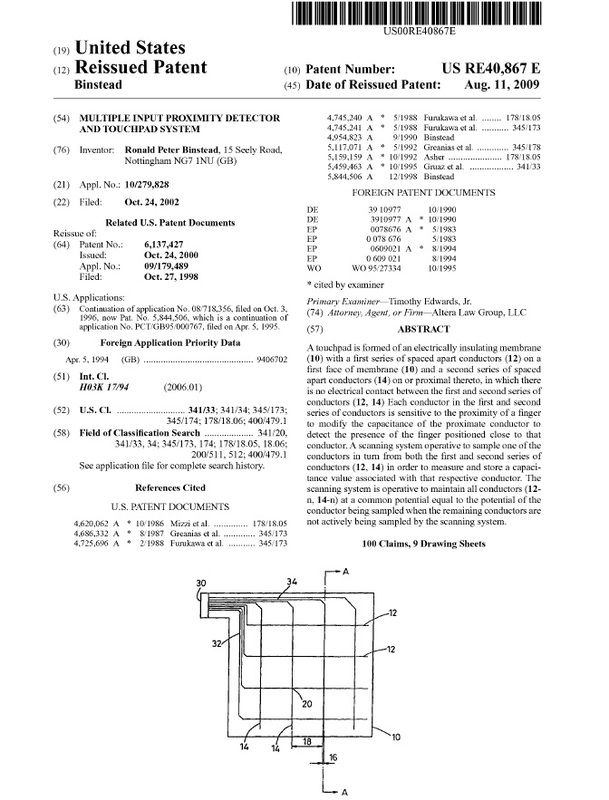 2015: Patent application for simple touch-screen manufacturing method incorporating wire into a clear film . 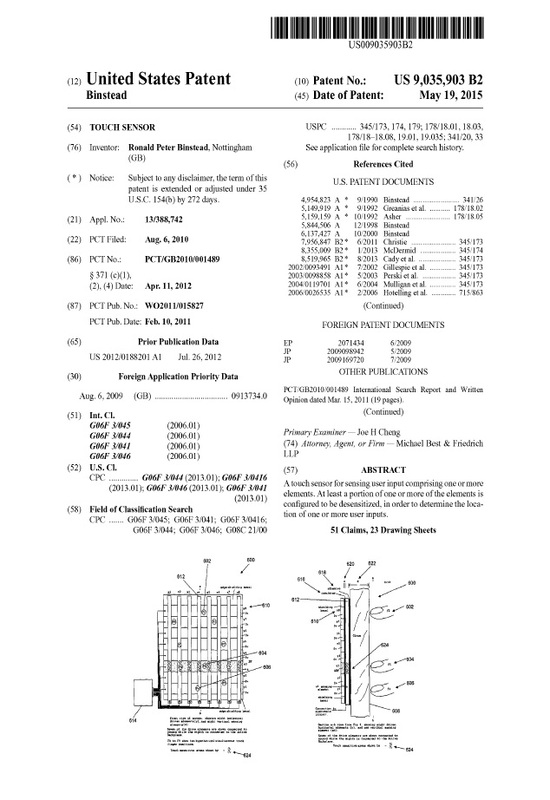 2015: Patent application for wire based touch-screens with reduced terminations without loss of resolution . 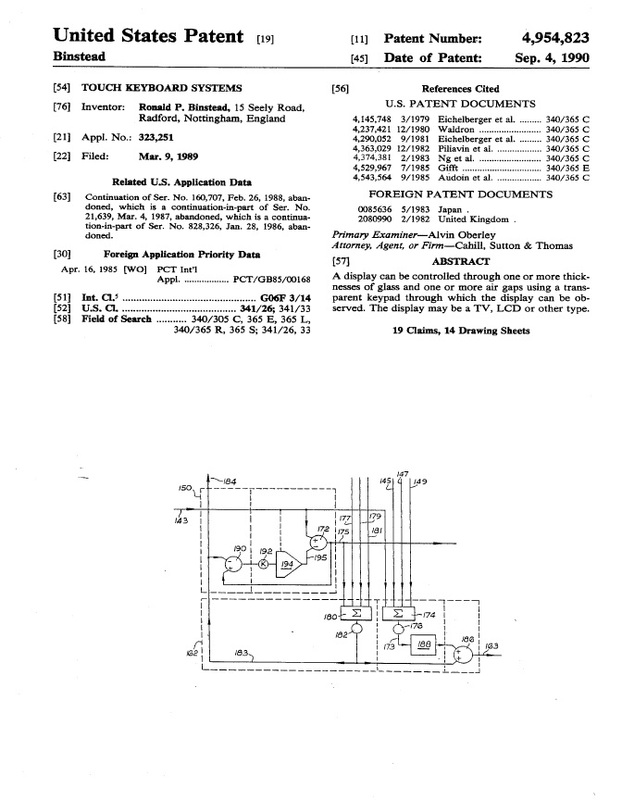 Patent for more efficient wiring layout .